Premium. Multiple cat strength with odor eliminating carbon for maximum odor control. Works better to eliminate odors than even the leading multiple cat litter (based on lab tests). 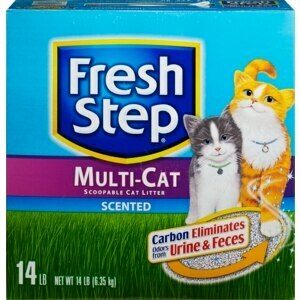 Fresh Step Multiple Cat Strength scoopable litter is now strong enough for multiple cats, because it contains even more of our patented ingredient that inhibits the growth of odor-causing bacteria. Plus, it has granules containing odor-eliminating carbon. How does carbon work? The carbon helps eliminate odors on contact, so odors are neutralized before they leave the box. Carbon is used as a freshening ingredients in many household items you may already use, including water filters, air filters, and fish tank filters. This patented formula has the same cat-activated fresheners and clump strength you expect from Fresh Step scoopable litter. It is just as clean and safe for your cat and home as other Fresh Step litters. Made in the USA. To Open The Carton: 1. Push in tab to tear open. 2. Pull out tab to pour. To fully experience the odor control benefits of new Fresh Step Multiple Cat Strength litter, do not mix with other litters. For first time use, start with an empty litter box and follow the directions below. 1. Fill your clean litter box with 3-4 inches Fresh Step Multiple Cat Strength cat litter. For best results, do not mix with non-clumping cat litter. 2. Fresh Step Multiple Cat Strength cat litter quickly forms a clump around liquid waste. Remove clumps and solids daily and dispose in trash. Do not flush. The rest of the litter stays fresh. 3. Add more Fresh Step Multiple Cat Strength cat litter to refresh your litter box each time you scoop. Maintain level of litter at 3-4 inches. Once a month, empty the entire litter box. Dispose of contents in the trash. Toxoplasmosis Warning: We would like to remind our customers, especially pregnant women and immunosuppressed persons, that cat feces can sometimes transmit a disease called toxoplasmosis. Therefore, always remember to wash your hands thoroughly after handling used cat litter. For further information, consult your doctor. Unused cat litter poses no toxoplasmosis threat. Caution: Do not use this product as a traction aid because product becomes slippery and slick when wet.